Miami, Florida October 22nd, 2018 – Latin Songwriters Hall Of Fame Co-Founders, CEO & Chairman Desmond Child & President Rudy Pérez opened the 6th annual LA MUSA AWARDS presented by Spotify and directed by Richard Jay-Alexander and music direction by Jon Rose, on October 18th at the James L. Knight Center by introducing Cuban singer, composer and producer, Descemer Bueno, recipient of the La Musa Conqueror Award, performing his composition “Bailando.” Followed by host Ektor Rivera presenting Spanish icon, Raphael, with the “Living Legend Award” who performed his classic song “Mi Gran Noche.” and received the first of the evening’s eight standing ovations. Aymeé Nuviola introduced and inducted Cuban Latin Jazz legend, pianist & composer, Chucho Valdés who performed his masterpiece “Mambo Influenciado” accompanied by the thirty-five piece orchestra. Latin Songwriters Hall Of Fame 2016 Inductee, Claudia Brant inducted Fernando Osorio who performed his Celia Cruz hit “Rie y Llora” featuring Sergio George on piano. Leonel Garcia of Sin Bandera honored Ralph S. Peer Award recipient Alejandra Lioutikoff with a special performance of “Bailar” including tributes by Mary Megan Peer Deputy CEO of Peer Music & Jody Gerson, Chairman of Universal Music Publishing Group. Eydie Gormé, was honored with the Desi Arnaz Pioneer Award for her groundbreaking Spanish language albums with Los Panchos. To posthumously accept on her behalf was her son, David Lawrence, who performed a moving tribute medley of “Sabor A Mi” & “La Ultima Noche” as his father Steve Lawrence proudly watched on from the audience. Director Richard Jay-Alexander (The Diva Whisperer) introduced British singer-songwriter, Maisy Kay, who performed “Colour”, a song she composed in the mythical Na’vi language for her new upcoming album “Dreamwalker” inspired by the James Cameron epic film Avatar. In a tribute to legendary music executive Karen Sherry, recipient of the La Musa Founders Awards, Co-Founders Desmond Child & Rudy Pérez introduced Puerto Rican singer, actress and television host Nydia Caro, who introduced Valerie Simpson who was joined on-stage by Erika Ender (“Despacito”) to perform Simpson’s MoTown Classic “Aint No Mountain High Enough” which she co-wrote with her husband and singing partner, the late Nick Ashford. 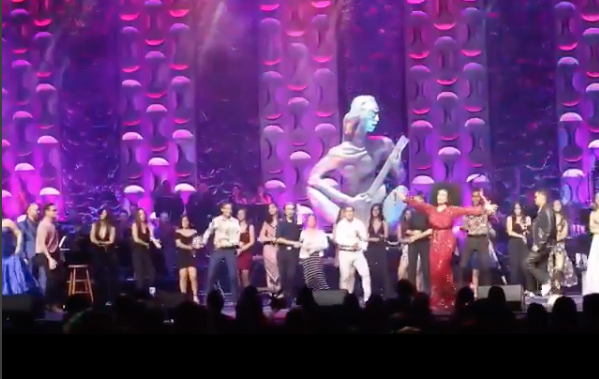 The LA MUSA AWARDS 2018 concluded with an explosive finale performance of the La Musa Song Of All Times, “MACARENA”, written by Los Del Rio, performed by Aymeé Nuviola, Gente De Zona, Marlow Rosado, Silvestre Dangond, Cachita Lopez joined by 30 young dancers from Latins In Action Everglades High School featuring The Powder Puff Boys.